About Discipline: What is Discipline? In this blog, we share with you proven parenting tips on how to discipline your child. But first, we start with the definitions about discipline. What is discipline? The word discipline means many different things. Some parents view discipline as a negative word which has very strict connotations. While some parents consider it as an essential aspect of child development and upbringing. Irrespective of where in the spectrum, you as a parent fall, it is important that you understand more about this topic. Oxford Dictionary defines the word Discipline as “The practice of training people to obey rules or a code of behaviour, using punishment to correct disobedience”. Wikipedia defines Child Discipline as “the methods used to prevent future behavioural problems in children”. When used as a verb (‘to discipline’) it means to instruct a child to follow a particular code of conduct. There is a big variation between parenting styles across cultures in the world and naturally, there are different types of discipline, that have evolved in different parts of the world. Because of the wide-ranging differences in customs, educational levels, belief systems and moral values across the world, each culture evolves its own methods and strategies with regards to child discipline. We look at this topic from the point of view of an Indian Parent. We specifically look at positive discipline techniques and techniques that can easily be used to inculcate discipline at home. Why do Indian Parents want their Children to be Disciplined? Do you as an Indian parent, have other reasons why you would like your child to be disciplined? If yes, please let us know in the comments section. Please feel free to share any other thoughts about discipline as well. What do Indian Parents mean by a ‘Disciplined Child’? 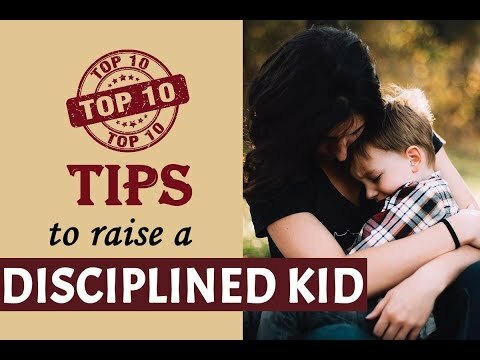 If these attributes of a disciplined child match those of yours, you will find our tips on how to discipline kids to be very useful and practical. Please feel free to share any other thoughts about discipline as well. Now that you have understood a bit about discipline and about how the majority of Indian parents view child discipline, it is time to answer the big question: How to discipline your child! Be One Step ahead of your child and Anticipate its Bad Behaviour! Your Parenting Style is Important Too! You can read about each of the parenting tips mentioned above in detail. Being disciplined is not a destination. It is a journey. Even adults have discipline issues occasionally. There will always be situations or occasions where everyone slips up. But the important thing is that we pick ourselves up and try and do better the next time. Like most things in life, we learn better when we start early. So, we would encourage that you as a parent start focusing on inculcating discipline from a young age. Earlier the child gets into the cycle of discipline, the easier it will be to sustain it for the entire lifetime. Set up a routine starting with Waking them Up! With a good routine set, you will greatly minimize the chances of unforeseen behavioural issues. Children learn from their environment and by imitating the behaviour of their primary caretakers. If you are not disciplined yourself, it is unlikely that your child will be. Whatever your ideas on discipline are, be it eating neatly or speaking politely with elders or doing homework on time, you need to walk the talk. If you are relying on forcing your child to be disciplined when you yourself are not, it is not likely to have a lasting impact. Leading by example is also a crucial positive discipline technique and is important if you wish to inculcate discipline at home. Parenting Tip 4. Be One Step ahead of your child and Anticipate its Bad Behaviour! Each child is different. But every child will exhibit certain patterns when it comes to bad behaviour. Is your daughter likely to throw a tantrum for a chocolate bar when you take her to a supermarket? Is your son likely to create a fuss before eating his meal? By observing and understanding the likely trigger points will help you anticipate. And once you anticipate you can prepare yourself and your child for it. Before I take my daughter out to the supermarket, I talk to her. I tell her that she will see many chocolate bars and candies in the supermarket, but I will not buy them for her. And I ask her if she is fine with this before I step out with her. This tactic has helped me a lot. Communication between the parent and child is key to developing a disciplined child. It is important to keep talking to your child about discipline. With regards to your behavioural expectations from your child, you need to explain your reasons clearly to the child. If I am announcing to my daughter that I will not buy her any candies in the supermarket and that she should be prepared for it, it is also important for me to explain to her my reasons for the same. For example, I explain to my daughter that her weekly quota of candies is over and that eating excessive candies is not good for her teeth. Sharing your reasons will gradually help the child to understand that there is a rational thought-process behind your expectations. After all, would you not expect your Boss to explain to you why He / She did not like something that you did? Imagine your confusion if your boss just admonishes you for reasons unknown! Lastly, do not let communication become a long-drawn negotiation. You need to be crisp and clear as to your expectations and the reasons behind the same. Do not negotiate with your child when it comes to your behavioural expectations. If communication helps your child understand the rationale behind your expectations, then consistency is the key to reinforce it and make it a habit. If you wish your child to hold the hand of an adult before stepping onto the road, it is important that you are consistent on this point. You need to insist on your child holding your hand, every single time without exception. If you wish that your son sits at the dinner table while eating his meal and not run around, you again must be consistent in your expectation and insist on it every single day. Consistency is key to habit formation. Very often in our experience of talking with many Indian parents, we find this crucial aspect missing. Many parents admonish the child once and then forget about for a while and then again repeat the same thing all over again. If you are serious about child discipline, then you cannot act on it occasionally. Parenting Tip 7. Your Parenting Style is Important Too! In our earlier article, we looked at important theoretical types of parenting. Naturally, parenting styles have a huge impact on how parents think about discipline. In general, Indulgent and Permissive styles of parenting are not conducive to raising a disciplined child. But at the same time, it is also important for parents to note that while the Authoritarian style of parenting does induce discipline in children, it may do so with certain negative consequences. After all, no parent would like their child to turn out meek, submissive or fearful. Authoritative style of parenting is the most balanced style that will give the best results. It has also been shown to lead to good social, emotional and cognitive outcomes in the child in the long-term. We therefore strongly recommend Authoritative parenting style as it strongly correlates with the principles of the positive discipline. Positive reinforcement to the child when he/she exhibits expected behaviour is more important than reacting harshly to undesirable behaviour. I guess it is human nature to notice the negatives more than the positives. It is for this simple reason that positive discipline works. I remember a story which my friend narrated to me: When he got 99/100 in Mathematics in a school test, his father’s reaction was not to congratulate him on getting 99 but to admonish for losing the 1 mark! It is important for us to be conscious of this fact when it comes to our child’s behaviour. Do not forget to appreciate your child when he/she displays exemplary behaviour. Even after a particularly bad episode of indiscipline, never forget to remind your child you love her. Reassure the child that your love is undiminished and is not contingent upon good behaviour. It will go a long way in making the child secure and will also reduce instances of unacceptable behaviour in the future. We understand as parents, that concepts like positive discipline are easier said than done. In some situations, parents might feel that principles of positive discipline are just not practical. But trust us when we say this, that positive discipline techniques can be easily implemented by most parents in 9/10 situations and eventually in all situations. But more on positive discipline and positive parenting in our subsequent blogs. Do not react Emotionally or in an Extreme Manner. Remember that the kid is observing you even in the heat of the moment. If you lose your cool and react by raising your voice or worse, if you react with a violent body language, you will end up defeating the whole purpose. Be calm and composed. If you are amidst other people, be mindful of the fact that admonishing the child will hurt its fragile ego. If there are family and friends or strangers around, we would recommend that you take the child away to another room to have a quiet chat. Remove the child from the immediate environment where the episode of indiscipline occurred. This helps immensely. Removal from the immediate vicinity will help the child come to terms with what just happened. It will also help the child find a dignified exit from the situation he/she finds herself in. Remember that in most cases even the child realises he/she has just done something that is not acceptable. Give the child a graceful exit path from the situation. By not changing the environment, you might be cornering the child, which will only worsen the situation. Do not ignore bad behaviour. In most cases, you will be in a position to not ignore the child’s behaviour. If you chose to ignore it, the child will not learn that the demonstrated behaviour was not acceptable in the first place. Worse, the child could get emboldened to test the limits of acceptable behaviour. Whenever possible, nip bad behaviour in the bud. Sometimes parents ignore bad behaviour to avoid confrontation. This is not a good idea. If you are not in a position to do this immediately, say you are part of a family gathering or having a party at a friend’s place, do not forget to have the conversation at the first possible opportunity. No shortcuts, please! The easiest way to handle behaviour is to promise something that the child loves. Usually candies or an ice-cream. These tactics will not get you far. You will only gain peace momentarily but will not make any headway in solving the deeper issue at hand. Redirect the Child’s attention towards Other things. Once the episode is past, a good way to take the mind of the child away from the current episode is to redirect its attention elsewhere. Once you have done all the steps mentioned above, there is no point in further dwelling on the same issue. It is time to move on with life. Once you have made your points, let things return back to normalcy. This tactic works wonders for infants and toddlers as they naturally have a small attention span and tend to forget and move on quickly. Nevertheless, it is a tactic that works more often than not even for slightly older kids. Finally, the child needs to know that there are consequences for behaving badly. It should know that you will not be happy and that you will take certain measures to express your displeasure. However, the nature of the measures will matter a lot. We would strongly suggest that parents avoid any kind of violent or corporal measures as consequences. Fact is that there is no need for physical punishment. Secondly, there could also be negative consequences of such measures in the long run. We encourage parents to explore options such as ‘Time-Out’. Time-out is temporarily separating the child from the environment where the incident of bad behaviour occurred. You can read more about it here. It is quite effective. I know many modern Indian parents who are raising very disciplined children without ever having to raise their hand. We hope you liked our tips on how to discipline kids! In a Hurry? Watch this 2-min-video on 10 awesome ways on How to Discipline a Child! Most parents would like to raise a disciplined and well-behaved child. But first it is important to answer the question: What is discipline? Are there types of discipline? From an Indian perspective, most parents consider a disciplined child as one who respects his/her elders, is responsible and mature, is punctual and avoids bad habits. In this blog, we look at 10 effective tips on how to discipline your child. Imbibing discipline from an early age, setting routines, leading by example, communicating effectively with the child, authoritative parenting style, engaging in positive parenting etc. will help you raise a disciplined child. How do you teach discipline to your child? Do you have any more ideas on how to discipline kids? How do you inculcate discipline at home? Great article with universal facts. I think Tip 3 should be taken more seriously. Good Work Guys!